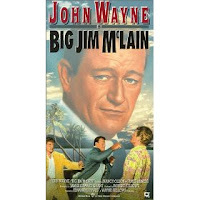 Tonight I caught up with a new-to-me John Wayne movie, BIG JIM McLAIN. Wayne plays the title character, a HUAC investigator hunting Communists in Hawaii along with James Arness. In his free time, Jim romances a lovely widow (Nancy Olson) and tours some of the islands' beautiful sights. The movie -- which struck me as something of a precursor to HAWAII FIVE-O -- is a fascinating snapshot of its era in terms of both political history and the visuals of pre-statehood Hawaii, which is gorgeous even in black and white. The film's a bit clunky in various ways, but I enjoyed it very much. Among the film's drawbacks are an uneven tone; for instance, a random comedy scene with Hans Conreid as a loony potential witness is dropped into the middle of the story. This doesn't fit well with the fact that at times the film aspires to be a docudrama, with the cast including the real-life Honolulu Chief of Police, Dan Liu. (Although Chief Liu seems to be an admirable man, his line deliveries are quite stilted.) Unfortunately the film veers uncomfortably from docudrama to Alan Napier's over-the-top portrayal of a Communist ringleader, which is too cartoonish to be very believably threatening. On the other hand, Wayne is at his '50s best in this, completely charming and likeable as the dedicated investigator. A scene where he punches an obnoxious man while barely mussing his tie is quite amusing, as is his tolerant behavior toward an alcoholic man-chaser (Veda Ann Borg) who persists in calling him "76" (Big Jim's height in inches). The romantic scenes between Wayne and lovely Nancy Olson -- who has a killer wardrobe -- are a welcome diversion. Their relationship seems very real, and it's quite enjoyable to watch it unfold; Wayne and Olson's scenes were my favorite thing about the movie. I've been enjoying becoming more acquainted with Olson's work this year in films such as UNION STATION (1950) and SUBMARINE COMMAND (1951). It's fashionable in some circles these days to belittle the postwar threat of Communism in general and Wayne's politics in particular, but I'm not one of those who buys into that point of view. The film starts out with Wayne and Arness tossing leis at the Arizona Memorial -- a stark reminder of the dangers our nation faced and could face again. In fact, a concluding scene with the Communist ringleader giving his cell members marching orders sounded rather similar to what we know of today's Al Qaeda. The film's patriotism is expressed a bit awkwardly at times, but it's sincere and at times quite stirring. The supporting cast also includes John Hubbard. That's the unmistakeable voice of Harry Morgan narrating after the opening credits. BIG JIM McLAIN was directed by Edward Ludwig. It runs 90 minutes. The black and white cinematography was by Archie Stout. 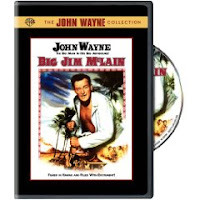 This movie is available on DVD as a single-title release or as part of the 6-film John Wayne Film Collection. The other movies in the set are WITHOUT RESERVATIONS, TYCOON, TROUBLE ALONG THE WAY, ALLEGHENY UPRISING, and REUNION IN FRANCE. It's also had a VHS release. This movie can also be seen on Turner Classic Movies. The trailer is available at the TCM website. An absolutely excellent review of a film I saw at twelve. The actors, the real ones, are tops, and of course, I like both the pictures politics and yours.